I found this very cool wrap skirt pattern from a vintage pattern scored at FabMo (you know that they have many treasures to find!). As I have a skort I found at REI that was good to ride in, I thought that a wrap skirt would do the biz. This skirt I embellished with some scraps I had for a bit of experimentation to mix up the dark grey corduroy. It is fully lined in gingham and since the first prototype I have added buttons and it sits more on the waistline which with an A line looks super cute! Fancy going for a ride! As it turned out I took this skirt for a ride this week and it was a winner with having the wrap cover the front and not being too flappy in the winds due to the heavier fabric. I am planning to make more the FabMo show in October. 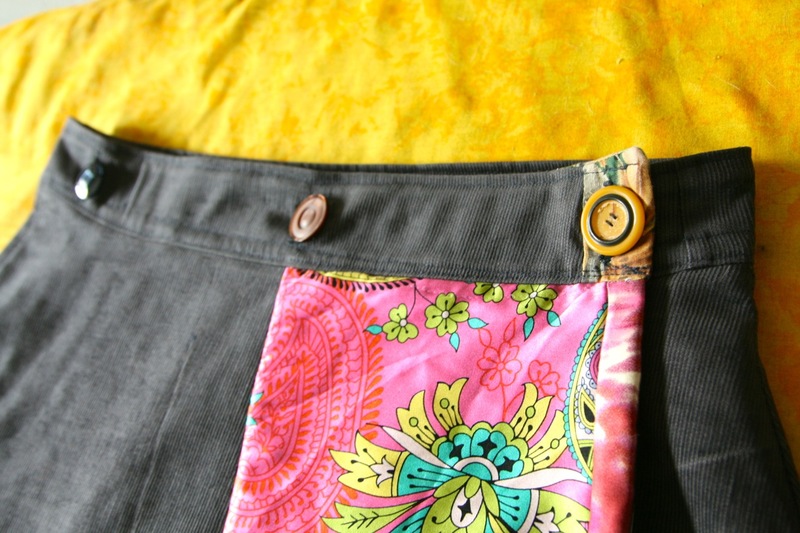 I think with an element of sewing on your own buttons to custom fit the waistband. I made this butterfly skirt ages ago from a dress I found at a thrift shop on the way to Mt Shasta. It was a vintage Hawaiian dress with a built in bra & halter neck- so not to my style at all. 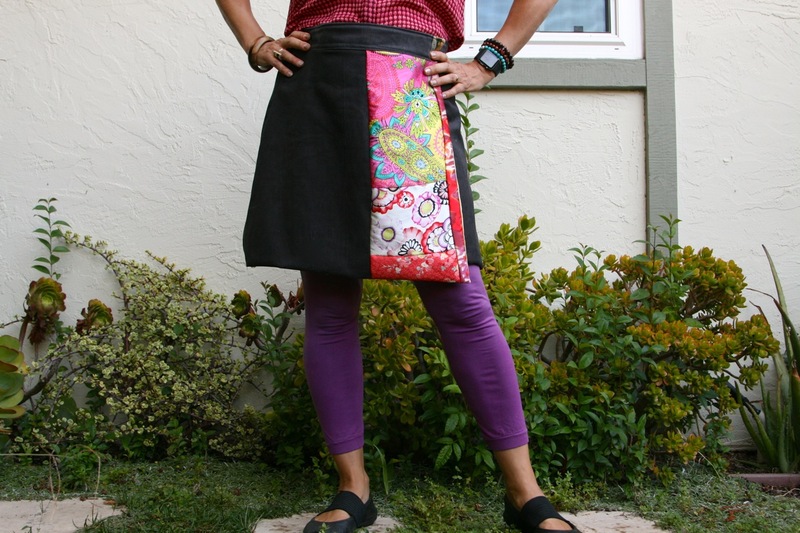 In the end I cut the skirt off as I love the print and made it into an elastic waist skirt. I took this skirt riding the other day in heels and it sat really well on the bike without any blown away skirt issue (I did not have any tights on underneath!) – so this is another winner I will implement in my range for the Fall! 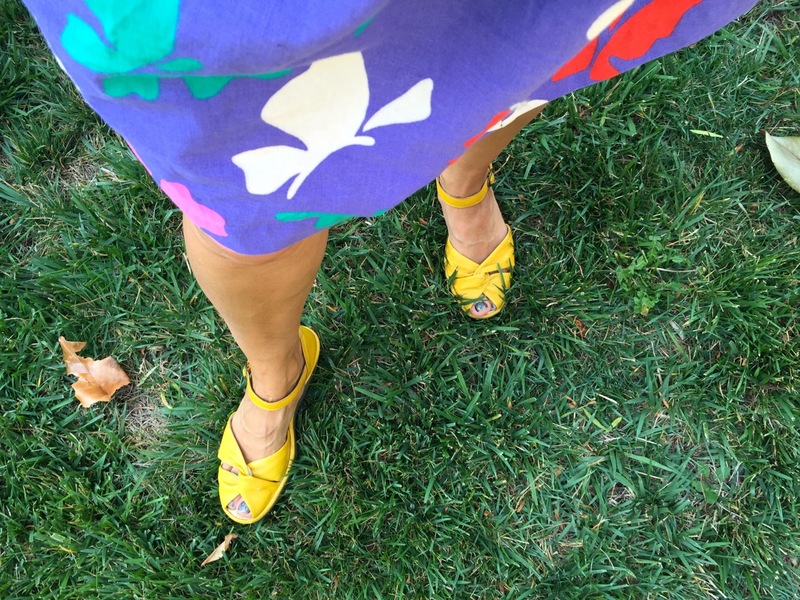 Riding in a skirt and wedges – what fun! And to make the week extra special – being the first week with the kids back at school and my other half on a conference trip in Seattle I treated myself to this Thai Herbal massage – I remember these fondly when I spent time in Thailand. Sawadee is just down the road from our house and so convenient! It made me feel more grounded and after 10 weeks of looking after the kids it was time to look after Mama! After the massage I had sushi next door at Joy Sushi where I sat at the bar and had a very tasty well made vegetarian roll with brown rice with a fresh salmon sake nigiri and to top it off – the service was very fast for lunch, I think I will have to go again. As I don’t wander my local strip mall too often I discovered a hair & nail salon run by some very friendly Vietnamese women – I treated myself to a manicure and a pedicure and an eyebrow wax. There is no feeling like treating yourself to something good, it makes you appreciate these times and that they should be repeated often! So I was quite amazed at what I found in my local neighborhood strip mall! 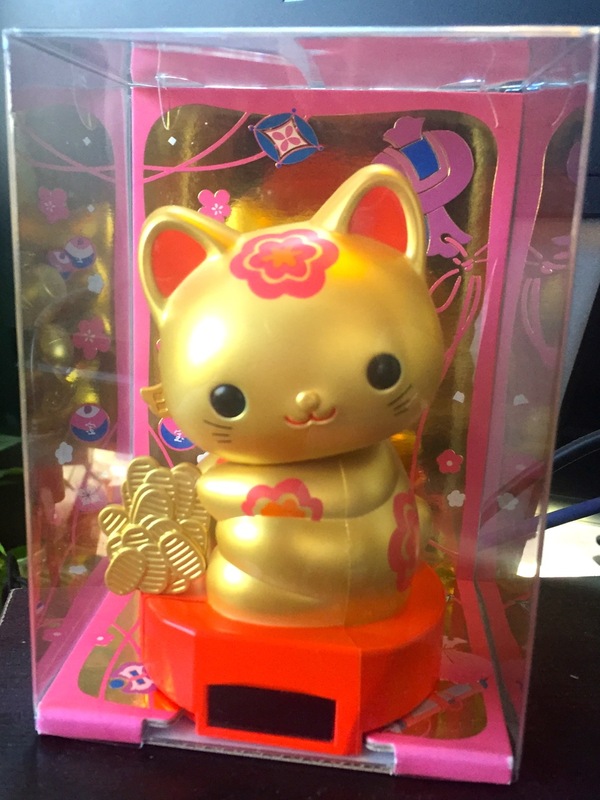 I feel just like this Lucky cat!